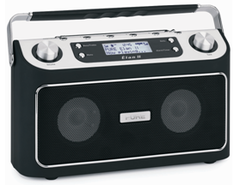 Towards the upper end of the digital radio spectrum, PURE has just launched in with the Elan II DAB/FM radio. The best thing about this radio is that you can pause and rewind it. Well, not everything – but it is capable of storing and then playing back certain broadcasts such as traffic reports or sports results. If you press pause, the Elan will stop playing out loud and record up to 30 minutes of any live digital radio broadcast. Pop back after answering the door or taking a phone call, and listen to the end of the radio show. Intellitext and textSCAN enable users to pause and control the scrolling text. The modern tech is cased in a cute little retro body that mimics old-style cassette recorders, with its rubberised grip and aluminium fascia, it looks quite sturdy as well – good because PURE mean the Elan to be portable. As you might also expect from a portable radio, it runs off a battery as well as the mains. Of course the battery life is pretty important: the optional ‘fit and forget’ ChargePAK rechargeable battery, provides, they claim, up to 35 hours of portable listening per charge. There is also an input for an iPod/ MP3 player, an alarm and kitchen timer and 30 DAB and FM presets, with digital amplifiers and custom-wound 3″ speakers, produces nice quality sound. Dinky. Like PURE’s other products, it’s has reduced power consumption in operation and standby, and uses recycled packaging materials. good question salim. amended the article above – basically – it’s any digital broadcast for up to 30 minutes. Neat design, but what was that about recording “certain” shows? The implication is that certain shows cannot be recorded?